SEOUL, South Korea — North Korea launched an intermediate-range ballistic missile on Sunday, the first test since a new president took office in South Korea this past week and called for dialogue with the North. The missile took off from the northwestern city of Kusong and flew more than 430 miles before landing in the sea between North Korea and Japan, the South Korean military said in a statement. Data on the launch was still being analyzed by the South to determine the type of missile. Saying that North Korea had been “a flagrant menace for far too long,” the White House said in a statement late Saturday in Washington that the test served “as a call for all nations to implement far stronger sanctions” against Pyongyang. “The United States maintains our ironclad commitment to stand with our allies in the face of the serious threat posed by North Korea,” the statement said. Russia, a Cold War-era ally of North Korea, is a member of the so-called six-nation talks aimed at persuading North Korea to give up its nuclear arsenal in return for diplomatic and economic benefits. The forum, first begun in 2003, has been stalled since 2008. On Sunday morning, Nikki R. Haley, the United States’ ambassador to the United Nations, condemned the test in a Twitter post that also referenced Russia. The missile on Sunday reached an altitude of more than 1,245 miles during its 30-minute flight time, the Japanese government said. That data, combined with the announcement by South Korea that the projectile covered a distance of 430 miles, showed that it was an intermediate-range ballistic missile that could target key United States military bases in the Pacific, including those in Guam, missile experts said. The North’s launch took place as its biggest supporter, China, was hosting delegations from around the world at its “One Belt One Road” forum in Beijing. A North Korean delegation, led by its external trade minister, was also attending. President Xi Jinping and his Russian counterpart, Vladimir V. Putin, who was at the forum, had a “fairly detailed talk” about the situation of the Korean Peninsula, including the North’s missile test, said Mr. Putin’s spokesman, Dmitri S. Peskov, according to the Russian news agency Interfax. “Mutual concern was expressed about how this situation is developing, and about growing tensions,” Mr. Peskov said. Hours after President Trump’s comment, Russia’s Defense Ministry said the North Korean missile posed “no danger” to Russia because it flew at a “significant distance” from the coast, Interfax said, citing a ministry statement. Russia’s ballistic missile early-warning system tracked the North Korean missile for 23 minutes before it fell into the sea, about 310 miles off the Russian coast, while its air-defense systems were “on combat duty as usual,” the statement said. This was the North’s first missile test since a launch on April 29 that was considered a failure, with the unidentified projectile exploding a few minutes after liftoff. 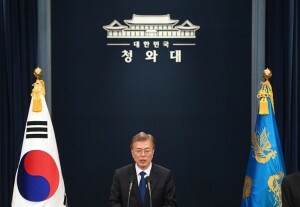 In South Korea, President Moon Jae-in ordered an urgent meeting of top security officials during which he condemned the missile launch as “a clear violation of United Nations Security Council resolutions” and ordered his military to be prepared for provocations by the North. Mr. Moon, who won the presidential election on Tuesday, said the move was “deeply regrettable” only days after he took office calling for dialogue with the North.